Once shining examples of American innovation, New England’s former manufacturing cities can be found along nearly all of our mighty rivers. And as it has been with Lowell, Lawrence and Haverhill — our own grandes dames of the industrial age — other Yankee ex-mill towns are discovering the power of art as a revitalizing force. The work of painters, sculptors and potters is attracting visitors from afar, helping these cities overcome legacies of unemployment and abandoned red-brick factories that have plagued many of them since the middle of the 20th century. North Adams is one of these places. Nestled into the northwest corner of the state on the banks of the rushing Hoosic River, the northern Berkshires community served as a manufacturing hub from the mid 19th century until the 1980s, when its factories turned out goods ranging from shoes and bricks to the pig iron used to build the nearly 5-mile long Hoosac railroad tunnel. The town’s last manufacturer, Sprague Electric Company — famous for producing semiconductors used in the construction of the atomic bomb during WWII — closed its doors in 1985. But in 1999, thanks to the folks at the nearby Williams College Museum of Art, a majestic phoenix rose from Sprague’s ashes. The Massachusetts Museum of Contemporary Art (MASS MoCA), which occupies the factory’s former buildings, is the largest contemporary art museum in the world. Visited by 120,000 people annually, MASS MoCA has more than 100,000 square feet of exhibit space on its 13-arce campus. The museum displays the work of many of the world’s most renowned conceptual artists, including Sol LeWitt, Federico Diaz and David Byrne. Along with its colossal installations—some are large enough to fill a basketball court—MASS MoCA offers educational programs to local schoolchildren and an impressive performing arts calendar. It also develops and leases space to local entrepreneurs, including restaurants, publishers and law firms, in an effort to stimulate the local economy and create jobs. It is obvious to any visitor of North Adams’ vibrant downtown that these efforts have paid off over the past 12-plus years. 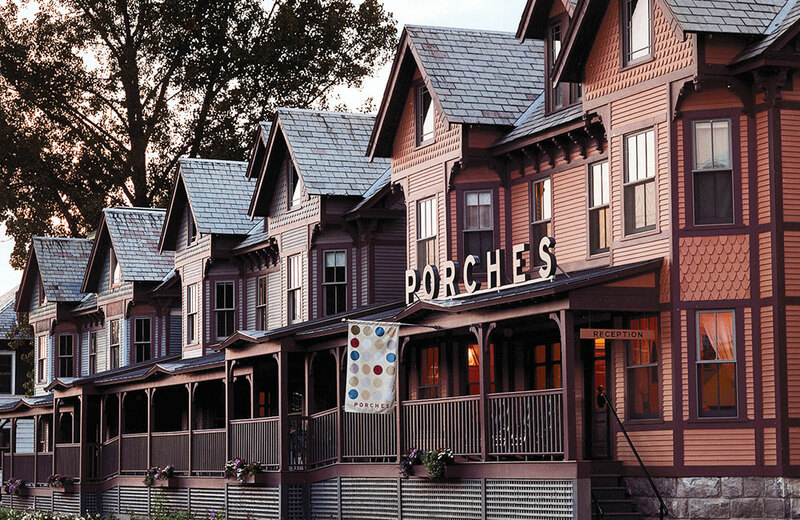 One of the museum’s most impressive acts of revitalization is The Porches Inn at MASS MoCA. Created from a series of six Victorian row houses that once served as worker housing, this stunning, 47-room hotel is an example of historic preservation at its best. Its buildings connected by a covered porch, the inn sits across from MASS MoCA’s Building Five and the Hoosic River. 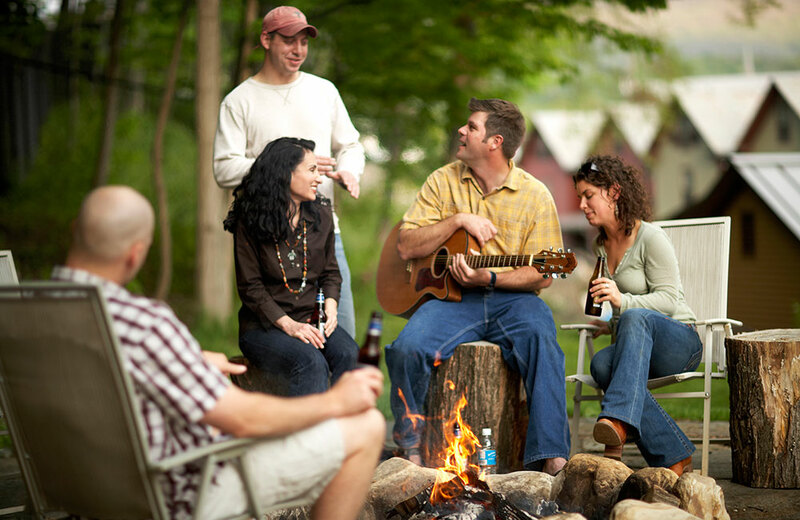 Porches’ luxurious accommodations and “industrial granny chic” atmosphere provide the perfect overnight resting spot for museum-goers, Berkshires outdoorsmen, and business and leisure travelers alike. The hotel was built from six former Victorian row houses that once served as worker housing. Photo courtesy The Porches Inn. Photo courtesy The Porches Inn. 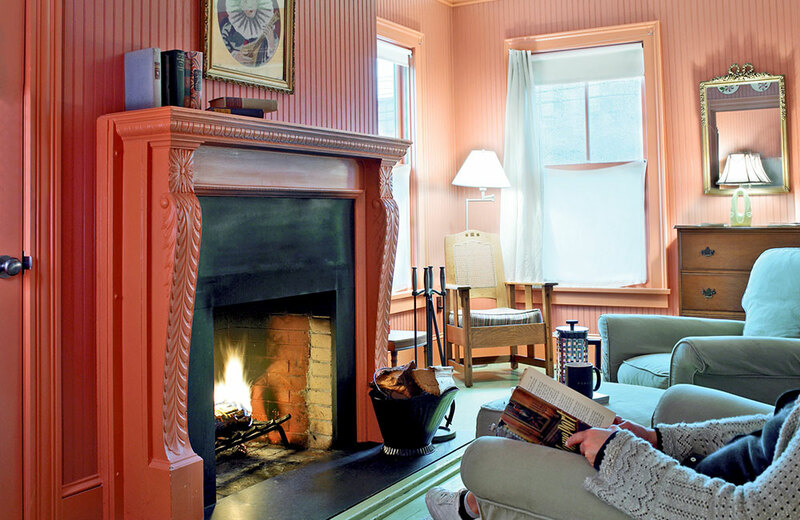 Sip drinks by the fire or curl up with a good book in the Porches' sitting room. Photo courtesy The Porches Inn. 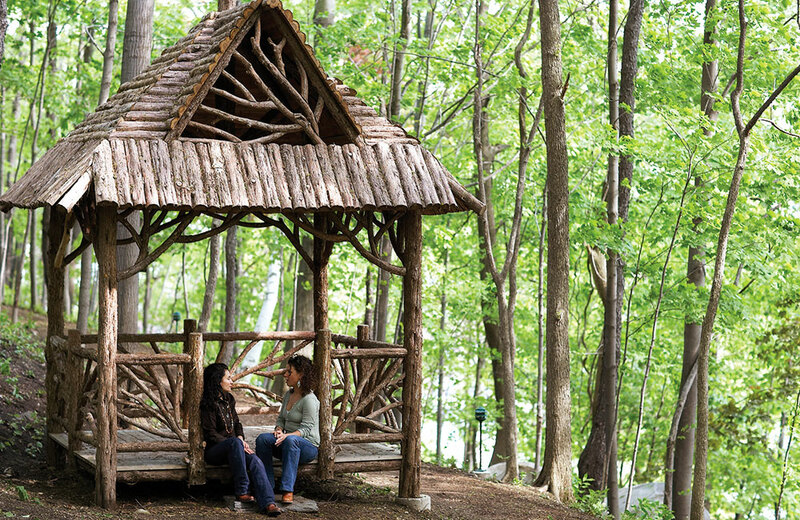 A rustic gazebo, a popular spot for weddings, is nestled into a pretty wooded area behind the hotel. Photo courtesy The Porches Inn. 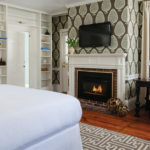 Each of the inn’s rooms is unique, decorated with an eclectic mix of Berkshires antiques, old-time Mohawk Trail souvenirs, funky paint-by-number artwork and the creations of local artists. As you might guess, most rooms have their own private porches. Overstuffed chairs for watching television or relaxing are both cozy and practical, and the beds, with their imported Italian sheets, are pure luxury. The Porches’ guest bathrooms come with freestanding, claw-foot bathtubs, spacious shower stalls and big terry cloth bathrobes. If you’re in the mood for a glass of wine or a cocktail, each room has a well-stocked minibar. Free wireless Internet is available throughout the property, and if you must work, you’ll find your room equipped with a generous workstation and a comfortable chair. The common spaces at The Porches Inn can (and should) be roamed like the galleries of a museum. Each of the six buildings contains its own collection of art and antiques, all carefully arranged and displayed. 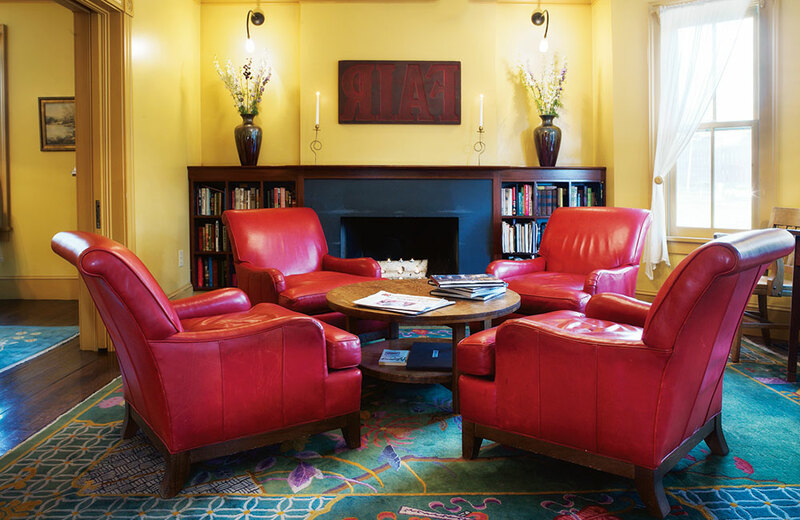 The inn’s main building, where the reception area is located, is also home to a comfortable sitting area where guests can enjoy the fire, read or play games while they sip a mixed drink. A sunny breakfast area is located here as well. 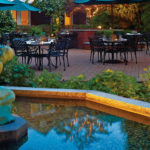 Daily breakfast, which is free for all guests, boasts products grown and produced by local farmers, restaurants and shops. 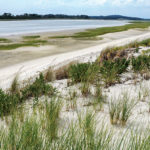 In addition to hosting visitors of local attractions, Porches is a popular spot for family vacations, reunions, business meetings and weddings. The hotel offers spacious family suites, and the inn’s Building Seven, a function area located at the back of the property, features a large-screen television, perfect for a family movie night. A rustic gazebo, the frequent site of wedding ceremonies, is set into an attractive wooded area behind the inn, along with a bonfire pit and a heated outdoor pool that is open year-round. The Porches welcomes pets in one of its six buildings for a nominal fee. (The inn’s own feline ambassador, Sabine, can often be found checking up on guests in the lobby.) And the front desk staff is second-to-none in friendliness and helpfulness, lending a hand with everything from luggage and dinner reservations to driving directions and suggestions for things to do. 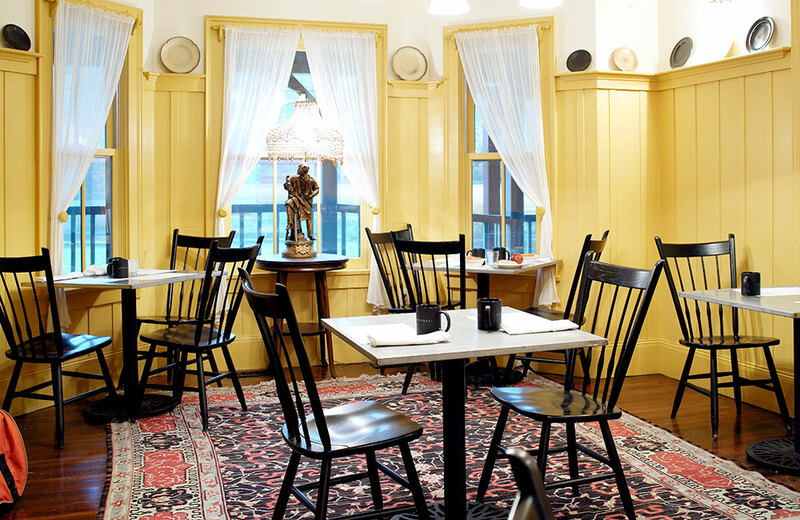 The Porches does not have its own restaurant, but it’s a five-minute walk to downtown North Adams and its many eateries, including MASS MoCA’s award-winning Gramercy Bistro, located at the museum. The hotel does, however, offer cocktail service, coffee and tea in the sitting area of the lobby. Other local cultural attractions include the North Adams Museum of History and Science and the Eclipse Mill Gallery in North Adams; Williams College and the Williams College Museum of Art in Williamstown; Arrowhead, the former home of Herman Melville, and the Berkshire Museum in Pittsfield. The Bennington Museum is in nearby Bennington, Vt.
Outdoorsy types will want to check out the dozens of hiking and cross-country ski trails at nearby Mount Greylock State Reservation and Mohawk Trail State Forest. Downhill skiing is available at Jiminy Peak Mountain Resort in Hancock. And during the warmer months, visitors can enjoy the white-water rafting and zip line excursions offered daily by a few local outfitters. A complete list of attractions is available on The Porches’ website.